I recently decided to purchase a Victorinox Swiss Army Climber II pocket knife. 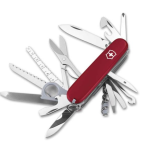 I’ve carried a Genuine Swiss Army Knife made by Wenger for over ten years, but after Wenger merged with Victorinox and shut down its own line of knives, I had no choice but to switch to Victorinox. Fortunately, the Swiss Army Climber II did not disappoint me. It’s every bit as good as other Swiss Army knives I’ve owned, and it hold its own against my friends’ Victorinox knives I’ve compared it to. Unlike almost everything else you buy these days, it wasn’t made in China. 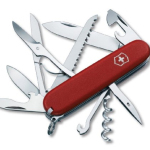 Victorinox has always manufactured its products in Switzerland, so you know it’s a top-quality knife. 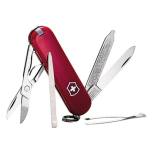 The Swiss Army Climber II comes with the following tools: a long blade, a short blade, a can opener, a bottle opener, a flathead screwdriver, a wire stripper, scissors, a reamer, a hook, a corkscrew, tweezers, and a toothpick. There’s also a key ring at one end. With all this, I expected it to be heavy, but it’s only 3.5 ounces. It’s only 3.5 inches long, and it’s not bulky, so it’s easy to carry around in your pocket. The best thing about the knife is probably the price. It’s about half the price of the original Swiss Army Climber. I compared the two, and I don’t see any significant difference, except that the handle is nylon, which is somewhat less durable than the cellidor handle on the original. But since nylon is a lightweight material, you may think that’s a mark in its favor. The first thing that stood out about this knife was the matte finish, which makes it different from most other Victorinox knives I’ve seen. 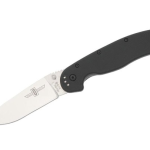 The new finish makes the knife less shiny, and it gives you a better grip on the handle. As soon as you pick it up, it feels great in the hand. One thing missing from this knife is the Phillips head screwdriver. There is a flathead screwdriver, and most of the time you can turn a Philips head screw with a flathead screwdriver, so it’s really no loss. In place of the Phillips head screwdriver is a corkscrew, something not included on many recent Swiss Army knife models. The corkscrew is not only good for opening wine bottles but also for picking apart tight knots. I tested out the reamer on an old belt I was going to throw away, and I was happy to see that it punched right through. The reamer has a thread eye in the middle, so it’s great to have if you ever need to stitch together two pieces of canvas or other thick material. The hook in the center of the bottom turns the knife into an instant handle. If you need to carry a heavy package, you can tie it up with twine and hook the knife at the top. It’s far more comfortable to carry something when the twine isn’t cutting into your hand. It’s great for heavy shopping bags, too. The hook is also great for pulling things you can’t easily grasp with your fingers like tent pegs. The long and short blades are extremely sharp, and I’m going to have to be careful about cutting myself. I’ve used it for various tasks for over the past three weeks, and I haven’t had to sharpen it once. I haven’t used the scissors as often, but they are sharp and cut well. The metal of the scissors is thin but also very sturdy, so I’m not worried about them getting bent. The blade of the can opener is also very sharp. It punched right through a can of motor oil. Overall, I was thoroughly impressed with the Victorinox Swiss Army Climber II pocket knife. It’s the perfect blend of durability and usability, and it fits it all into a small and light package. 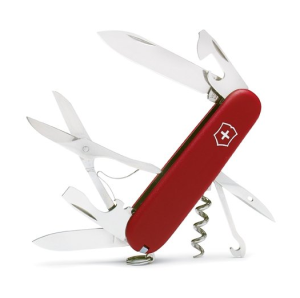 Even though this is considered a budget Swiss Army knife, it’s as good as the best. If you’re looking for an affordable Swiss Army knife for your glove box or your pocket, you should definitely give this one a try.